Hunters have told me about the church, about the gods and their love. But do the gods love their creations? I am a doll, created by you humans. Would you ever think to love me? Of course, I do love you. Isn’t that how you’ve made me? The church she’s referring to is the Healing Church. It’s the primary social institution in Bloodborne’s city of Yharnam and the source of blood ministration, a medical and spiritual practice that involves consuming special blood to heal illnesses and grow closer to the Healing Church’s gods. The ritual bears a resemblance to the Christian sacrament of Communion, which is just one of the many commonalities between the Healing Church and the Catholic Church, that real-world tension to the Doll’s question. Do the gods love the people who worship them? What if they don’t? Christian imagery is everywhere in Bloodborne. The city is hewn from the Gothic Revival architecture of the 18th and 19th century—all ornate steeples and pointed arches. The game’s early hours are a slow climb through the streets toward a massive cathedral, past beasts hung on crosses and burned at the stake like the victims of so many panics and witch hunts. Worshipers assign varying degrees of literalism to the idea that the bread and wine (or grape juice, depending upon your church’s level of teetotalism) consumed during Communion is the body and blood of Jesus—it depends upon personal beliefs and denomination. But at the very least, Christianity is united in the belief that this ritual is a way to connect and identify with God as made manifest in Jesus, hence the name Communion. It’s a way of declaring allegiance with and drawing closer to the Lord—or as Paul puts it, “proclaiming the Lord’s death” until he returns. When the vicar of Bloodborne’s Healing Church prays to seek out the old blood and administers blood ministration to her followers, it seems she seeks the same ends: to draw closer to the Healing Church’s gods, to ritualistically enact intimacy with them, to sit at the table of the Great Ones the way Christians want to sit at the table with Jesus and his disciples. There are icons lining the stairs into the Grand Cathedral, the way a Christian cathedral might be decorated with crosses or saints. But these icons are inhuman and strange—monstrosities with bulbous heads and blank eyes. Christianity worships the image of a loving, personal God become man. The Healing Church worships indifferent, malformed aliens whose terrifying appearance is enough to drive a person to madness. If you make it far enough into Bloodborne, you meet those gods. They’re otherworldly creatures of immense size and power who seem to have taken an interest in Yharnam, but their exact motives are unfathomable. Some aren’t immediately hostile, either, like Ebrietas. She’s the Healing Church’s greatest discovery, a Great One seemingly marooned on our plane and who’s been hidden away atop the Grand Cathedral. Known as the “Daughter Of The Cosmos,” she’s somewhere between a squid and a dragon, with bat-like wings, a face full of tentacles, and the same haunting blankness as all the cosmic beings you encounter in Bloodborne. The closer players get to each of the Great Ones, the more bodies they find carrying Madmen’s Knowledge, a token of power formed from the destroyed intellects of the most devoted worshippers. Its abundance is a result of what little we can intuit about the Healing Church’s gods: Unknown and unknowable, they are uncanny creatures that have a troubling tendency to drive their followers insane in the pursuit to comprehend them. And everyone who hasn’t gone crazy from getting close to the Great Ones has become a monster. That’s the Healing Church’s other secret. The lycanthropic plague infecting Yharnam’s citizens? It comes from the blood. When the blood of the Great Ones—perhaps the church’s ever-flowing font now comes from Ebrietas herself—is mixed with human blood, those exposed grow fur and fangs and fury. And the higher up the Healing Church one progresses, which undoubtedly promises more exposure to the old blood, the fiercer and more terrible the transformations become. This, then, is the endpoint of the Healing Church’s quest for intimacy. The Healing Church applied the Christian logic of Communion to impersonal, alien beings, and it destroyed them. As a hunter, the player is cleaning up the mess left behind by the Healing Church’s vast theological failure. 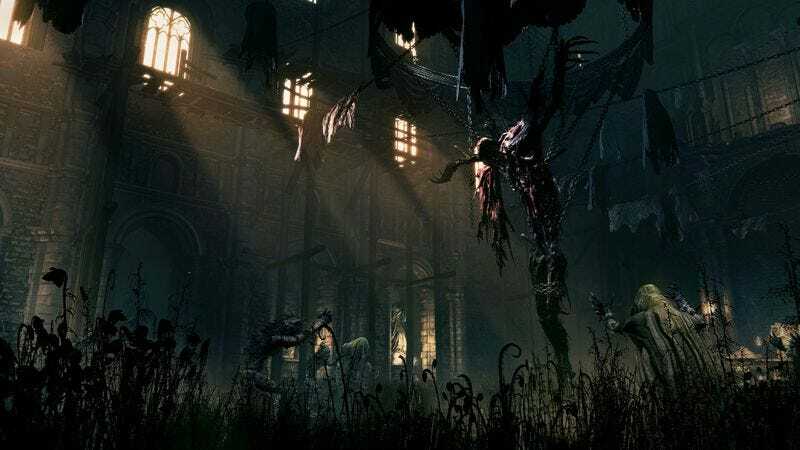 Bloodborne is a fable about religious logic misapplied, taking ideas from real-world Christianity and applying them to a place so mad and cruel that those ideas become apocalyptic threats. The Great Ones aren’t gods, really, at least not the way Christianity would frame them. They’re just incomprehensible creatures from some alternate dimension. You can even fight and kill a few of them. As such, the Doll’s intriguing question springs from the same false premise upon which the Healing Church’s doctrine is based.